Grilled Steak, spicy, dry rub, Thyme for Cooking classic summer main course. We used to get 'London Broils' when we lived in the U.S. that were great on the grill. Just a light sprinkle of seasoning is all they needed - and maybe some bottled Barbecue sauce if you are so inclined. We like them medium rare. On a hot grill they can cook very fast - so be mindful! Mix all dry ingredients and rub on both sides of meat. Grill on barbecue over high heat 3 - 5 minutes a side. 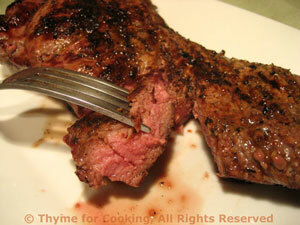 If you like rare, remove after three minutes a side, make a small slit in one and check. If not done to your liking return for another 1 - 2 minutes a side. Remove from heat and serve. Cooking times will vary according to the type and thickness of meat you choose.